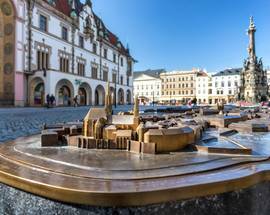 For those looking to escape the crowds of Prague, Olomouc, a roughly 2 hour train ride from the capital, should capture your heart. The pretty university town is small enough to be charming, yet interesting enough for at least a weekend. 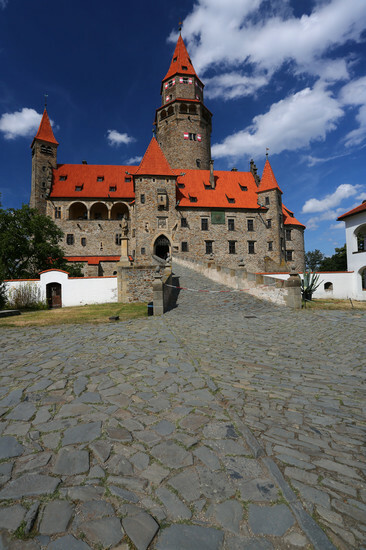 Located in Moravia, there’s a plethora of architecture and history. 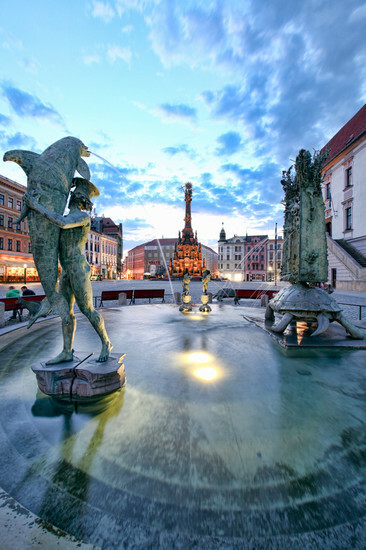 Olomouc is the fifth largest city in the Czech Republic with a population of about 100,000. 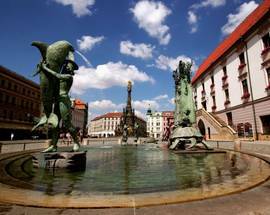 It is home to the country’s second oldest university (after Charles University in Prague) which means its culture scene is alive and there’s a variety of dining and entertainment options available. 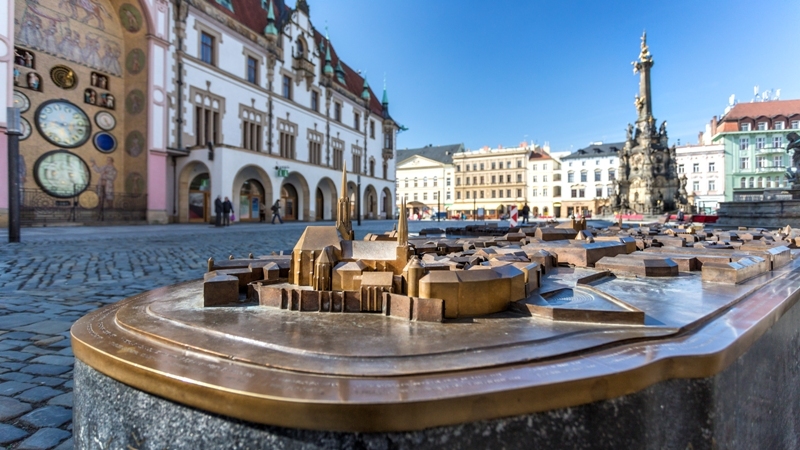 To get a feel for the city, start your day on the main square, Horní náměstí. There you will find the UNESCO listed Holy Trinity Column. 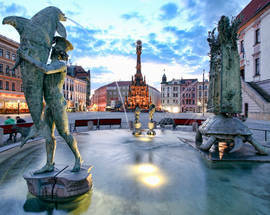 It is the largest collection of Baroque statues within the framework of one sculpture group in Central Europe. The lower part contains a chapel, which can be visited seasonally, April-September. The column is made up of 18 statues, 12 torchbearers, 6 reliefs, a sculptural group of the Assumption of the Virgin Mary and finally at the top, the Holy Trinity. 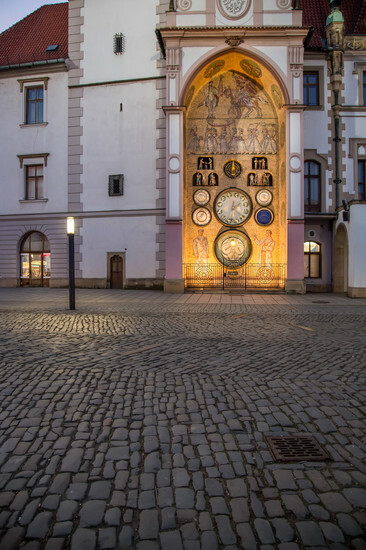 Also on Horní náměstí is an Astronomical Clock – we told you a visit would be like Prague! 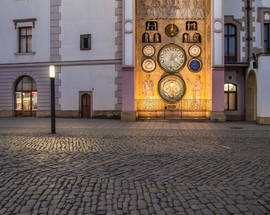 This clock is quite different from the one that draws massive crowds to Old Town Square. The timepiece dates back to the end of the 15th century, however the form it takes here is much different than what the original planners had designed. During World War II, the clock was so damaged in the fighting that City Hall decided not to reconstruct it, but instead design something modern. What you’ll see now is a 1950s work depicting Communist era proletariat, like builders, agricultural workers and other labourers. The clock performs once a day, at noon, for about five minutes. 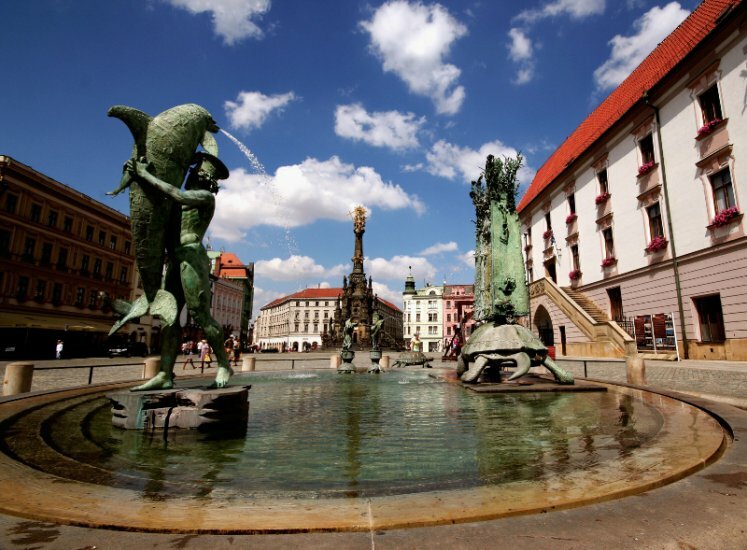 There are a number of interesting museums in Olomouc – something for nearly everyone. 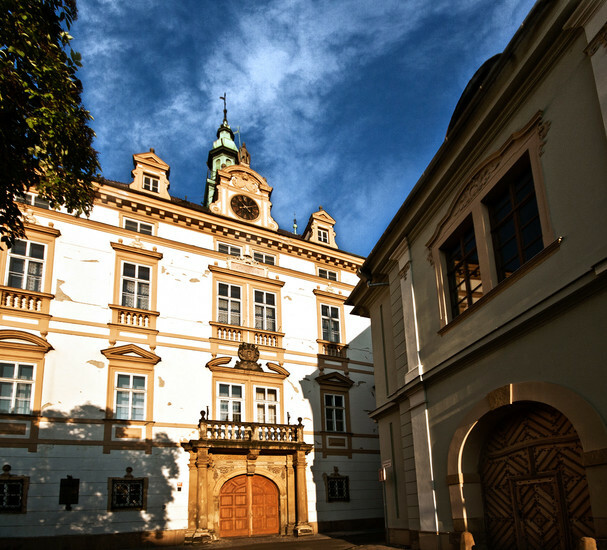 The beautiful Archdiocesan Museum, located on Václavské náměstí, is home to a permanent exhibition of the Olomouc Archdiocese, a picture gallery featuring paintings dating back to the 16th century, and the Mozarteum, a great hall commemorating the famous composer’s stay in Olomouc. The city is rich in religious history. 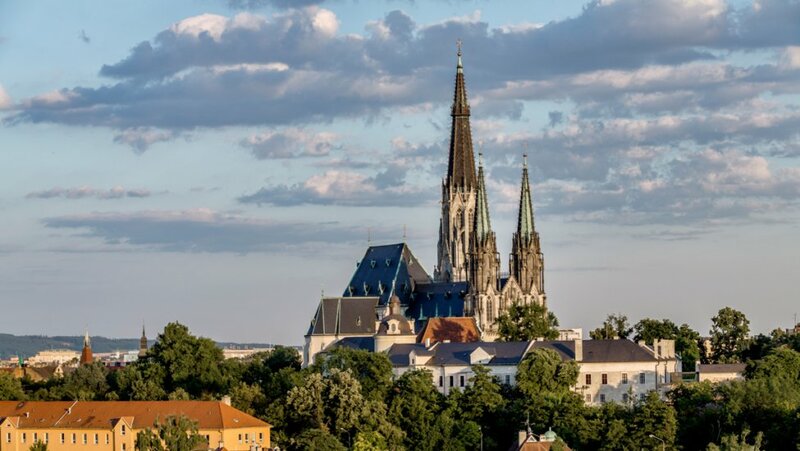 Besides the Archdiocesan Museum and the Holy Trinity Column, visitors can also marvel at St. Maurice’s Church, the biggest Gothic church in the region, dating from the 15-16th centuries and the oldest Moravian monastery, the Archbishop’s Palace located in the Olomouc suburb of Hradisko. 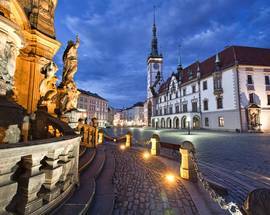 The most significant sacred building in Olomouc is the Bishop’s Cathedral of St. Wenceslas, built in 1109. 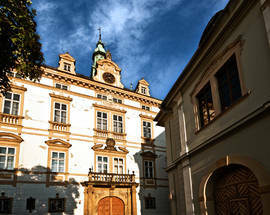 If you have a couple extra days, explore the lovely Moravian countryside outside of Olomouc. 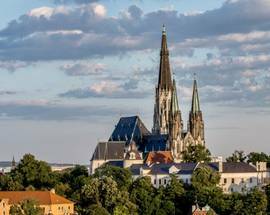 The city is a great place to base yourself while discovering the beautiful towns and tasty Moravian wine in the eastern part of the county. 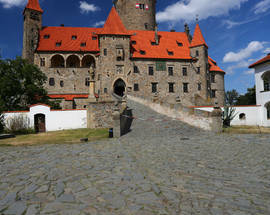 Litomyšl and Kroměříž are two charming towns that will keep you busy for an entire day.